We ate in the Combe Martin Inn lest evening and the food was good, but the breakfast was pretty ordinary really, and I must say that it wash’t the best place we had stopped in on the trip, a little disappointing but the position ewas of course terrific the place is just a little tired and needs a bit of work, room was clean, but having to walk across the hall to your own bathroom is not what I expect. I’m not a snob but when you pays your money you expect a certain amount of luxury, we will be letting Lets Go Walking know our thoughts. OK lets put that aside because it sounds like it was a disaster when it certainly wasn’t, we left with the prospect of a good day (weather wise) in front of us. going certainly wasn’t going to be as hard as yesterdays however the distance was the longest of the trip (official distance 12 miles roughly), and this in itself would be tiring enough. The climb out of the village was cloudy but the sun soon started to peek through and throughout the day we had some beautiful skies and we could see back as far as the start point at Hartland Quay, wonderful. We walked round Cambeak as the National Trust had put in some new paths to help stop the erosion that existed on the ‘original’ path route. We then made our way along the route past the Strangles and onto High Cliff, the highest cliff in Cornwall, not to be confused with the second highest sheer drop that we had past previously! We headed onto Anne’s looked forward to spot by the name of Seals Hole near Fire Beacon Point, apparently where seals like to ‘hang out’ and breed, however today, they were all out, sad face from Anne. However the climb down rather than the ‘over the top’ route gave us some spectacular views and we continued to be inspired by the coastline. Climbing out and toward Hillsborough and Pentargon, Anne looking back spotted a seal in the water and we spent some time watching this lone seal who was seemingly checking the joint out. We headed out of Boscastle which had some TV Vans awaiting to report on the anniversary of the Boscastle floods which occurred back in 2004. We passed the Lookout Station and headed on towards Bossiney and Tintagel. A secret wish was to go down, and if the tide allowed swim at Bossiney Haven/Benoath Cove, we had spent a week at Bossiney many years ago and we had gone to the beach there , the weather was kind and we arrived and Bossiney Haven with the tide having only just turned and the sun out, a swim was in order. After out dip we climbed out and on to Tintsagel taking another diversion this time around Barras Nose where I was able to take another 360 degree picture the previous today was at Boscastle, and I also got some pictures of a your Peregrine. We got to our resting spot for the night, King Arthur’s Arms Inn I did my usual lets get the images from the GoPro onto the Hard Drive. And while I’m on that subject the 32GB SD card was filled yesterday before the end of the walk, as today was so much longer and stupidly I didn’t bring along a spare card, I had to use a 1 second gap, for a period today on the time lapse rather than the ½ a send gap I had been, this worked by the ay and I had space at the end of the day. After walking around Tintagel and having a drink elsewhere we headed back to the King Arthur’s Arms Inn and ate there a very enjoyable meal and some very good beer. We headed back up to our room to catch the last few minutes of Doc Martin, why do I tell you this well tomorrow we are heading for Port Isaac, OK from those of you reading this in the UK that has a meaning for all the rest here’s a link. I have done a couple of 360’s which can be found here today one at Boscastle and also at the end of Barras Nose, Tintagel. 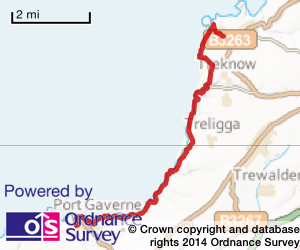 17.16 miles Distance, including extra walks to beaches and to the ends of any points we visited. Total time out including stops photo opportunity, enjoying tea and cake, 8 hours 30 mins. Total this week 25 hours 41 mins. Total walk time out 99 hours 28 mins. An extra piece of info from my Fitbit total Steps = 39094 including extra walks to beaches and to the ends of any points we visited.